Differences Between Characters in Temple Run 2 and the Original? It's hard to believe Temple Run 2 was released with only four playable characters. Released in 2013, Temple Run 2 has become one of the best games on the iPad, and Imangi Studios has steadily grown the game, adding new maps and releasing dozens of new characters for us to play. Unfortunately, many of these are limited-released characters that were only available for a specific period of time. The good news is that there are few differences between the different characters in Temple Run 2. The core characters in Temple Run 2 are Guy Dangerous, Scarlett Fox, Barry Bones, and Karma Lee. Each of these characters unlock a special power-up, but once unlocked, these power-ups can be used on any character. This makes the actual choice of character a choice in appearance, although you may want to prioritize unlocking the core characters in order to gain access to those special abilities. We'll start out with the basic cast of characters in Temple Run 2. Each of these are unlocked through paying either gold or green gems. Most characters in Temple Run 2 also have alternative outfits to change their appearance, and a few can even wear hats that are unlocked through attaining special goals within the game. Guy Dangerous. Guy is the default character in Temple Run 2. He includes the Shield power-up. Scarlett Fox. One of the most popular characters, Scarlett is unlocked for 5,000 gold. She includes the Boost power-up. Barry Bones. Barry looks best in his outrider outfit. He is unlocked for 5,000 gold and includes the Coin Bonus power-up. Karma Lee. The last of the characters that are tied to power-ups, Karma costs 5,000 gold and includes the Score power-up. Basic characters are unlocked for 5,000 gold. Most have special outfits that can also be unlocked, but a few can only wear hats. Collection unlockable characters can only be unlocked after collecting special character tokens. These are found by playing the game. There is no shortcut for unlocking these characters. Cleopatra: Requires 5 character tokens. 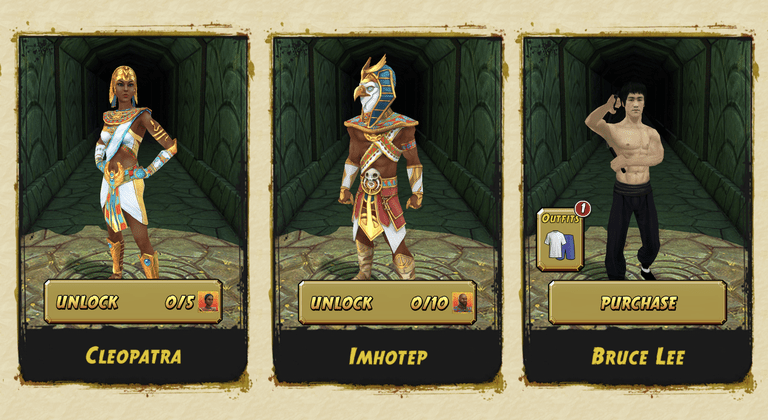 Imhotep: Requires 10 character tokens. While most characters can be unlocked simply by playing the game, and many can also be unlocked by purchasing in-game currency to speed the process, a few can only be bought outright. Bruce Lee: Bruce comes with nunchucks and a special jumpsuit additional outfit is free. Usain Bolt: Usain comes with two different uniforms. In addition to these characters, there are over a dozen limited-time characters. These characters are no longer available on a permanent basis, but some may pop back up during special events, These characters include but are not limited to: Santa Claus, Mrs. Claus, Freya Coldheart, Sigur Frostbeard, Wolfman and Sir Montague, a skeletal explorer. Temple Run 2 also released some limited-time football players: Russell Wilson, Colin Kaepernick, Calvin Johnson, Tom Brady, Peyton Manning, Cam Newton, DeMarco Murray, and LeSean McCoy. Don't worry too much about gold coins at the first of a run. They are worth more when you build up multipliers, so concentrate on surviving at first. Always keep your eyes on your next turn or obstacle. As you progress, the game gets faster. Want to slow down? You can intentionally trip by running over a tree root, but the monkeys chasing you will catch up. If you do it twice in a row, they will probably catch you. There are no differences between the original Temple Run characters other than appearance. Guy Dangerous: Guy is your average explorer. You begin the game with Guy Dangerous unlocked. Scarlett Fox: Scarlett is a cunning escape artist. Collect 10,000 coins to unlock Scarlett Fox. Barry Bones: Barry is a city cop with an attitude. Collect 10,000 coins to unlock Barry Bones. Karma Lee: Karma has the fastest legs in the Far East. Collect 25,000 coins to unlock Karma Lee. Montana Smith: Montana is the second greatest explorer ever. Collect 25,000 coins to unlock Montana Smith. Francisco Montoya: Francisco is a conquistador. Collect 25,000 coins to unlock Francisco Montoya. Zach Wonder: Zach is a football star. Collect 25,000 coins to unlock Zach Wonder.